TGIF? Yeah, right. Anyone who follows me on Twitter or Facebook knows this has been a trying morning, but it is Friday the 13th after all, so what can I expect, really? It was the final dress run for a musical, and oddly I didn’t have the feeling that I didn’t know my lines. I could very clearly see a trail of bugs crawling across my carpet from my patio door towards the kitchen. This one is more in line with my usual anxieties, so I’m at least in a good place with it. Even with the rest, I fought the snooze, then logged onto work remotely — Friday is my telework day — and made a quick trip to the store for coffee and lunch stuff, randomly running into a co-worker while on the way and feeling like I suddenly had to explain myself, even though this co-worker has way more telework days than I do. So about that store trip, how it go, you might not even be close to asking? How much did I need coffee this morning? Went to store, bought it, forgot to bag it & lost my receipt so can’t go back for it. Yeah. That well. Thankfully I had instant coffee at home and was able to make do, but I’ll have to figure out a coffee plan for tomorrow. A response to that tweet reminded me that today is Friday the 13th and I should have taken more heed as it pretty much is feeling like “one of those days”. I’d just printed out some documents for a conference call and started going through piles of mail that accumulate around my apartment, tossing the junk, etc. I almost never do, but opened my Comcast bill. I’m on auto-pay, so I don’t have to think about it too much. It’s a good thing I did as the amount due was over four times my usual! Did you know there are such things as “ghost charges”? Because I didn’t, but that was the phrase repeated to me by the agent. Which I guess was their attempt at saying, “It’s not your fault, it’s probably our fault, but we’re not going to say it’s our fault. ¯\_(ツ)_/¯” Add that to the fact that they advised the best thing was to go ahead and get fleeced by them and they’d credit me back, but couldn’t give me a confirmation number or message. Yeah… I don’t think so. Oh and now my modem suddenly restarts itself and won't connect. Is this because I had to get salty with a @comcastcares rep earlier? Today was clearly a day to be tested by Comcast, and it’s barely even half over! I got the internet sorted again, but now I sit here waiting to see what happens next. I don’t really lend much superstition to Friday the 13th. 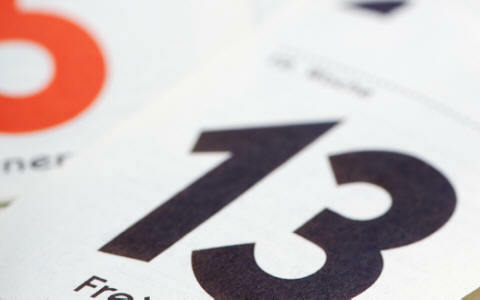 Heck, I was born on a 13th, but it is looking like a Murphy’s Law day at the least and I’ve barely even left the house! I might head out later for a happy hour, but it’s been raining, so I’ll have to watch for lightning strikes, puddles, oncoming cars, or my usual issue: getting smacked in the head by someone who doesn’t know how to carry an umbrella. I’m doing my best to stay pumped up, listening to Summer mixes online and wishing everyone out there a very sincere TGIF, regardless of the date. Stay lucky out there, folks! 2 Why do they capitalize “PowerPoint” like that? So annoying. Next story Walking a 5k? 10k? Virtually no problem!